There is an extravagant time skip between A Swiftly Tilting Planet and A Wind in the Door. Meg is now married to Calvin and very much pregnant. I'm actually happy that an author didn't waste sequels on developing romance and dragging us through Meg's angsty teen years. She is home for the Thanksgiving holiday--where only Charles Wallace remains at home--since Calvin is overseas at a lecture. Her mother-in-law is suddenly drawn to attend when she has never participated in Murry functions previously. 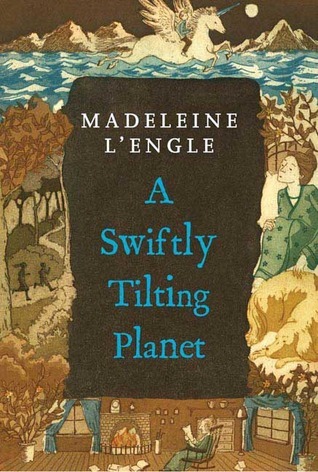 L'Engle has taken us through the cosmos to determine what is reality, shrank us to minuscule farandolae to determine size is relevant, and now she is sending us careening through time to determine inter-connectivity. Charles Wallace must learn that when you ask Where your are, you should really be asking When. What would a children's fantasy be without mythical creatures? We've met aliens, stars, and dragons. Now, we get unicorns. Such beauty and glory in the creatures that L'Engle depicts. I love the morals and the lessons that are ever present in the "The Time Quintet." Some of the books are better than the others, but the series as a whole should never be forgotten in time. The story elegantly weaves the history of people through a thousand years of time. The decisions that were made by our ancestors is the consequence of our future.